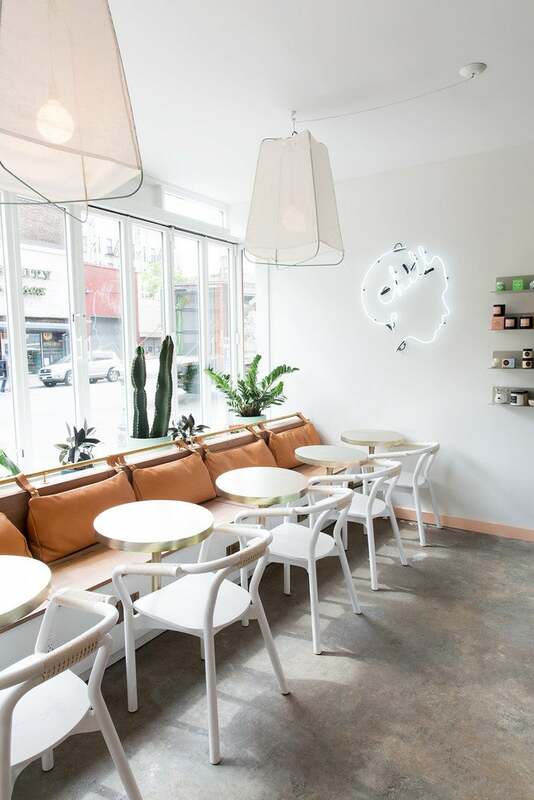 Tucked into the Lower East Side, Chillhouse is the NYC wellness cafe-meets-nail salon-meets-spa concept you’d always dreamed of. Designed to be an escape for city-dwellers, the space is perfect for those seeking an accelerated path to relaxation via nail-art manicures, CBD-infused massages, and a wellness cafe. Thankfully Chillhouse believes in treating yo’self, but doesn’t think you should have to break the bank or your calendar—each indulgence is cost-effective and simple to schedule. Want to save even more on your manis, iced matchas, and massages? Chillhouse has monthly membership programs geared towards snagging your monthly indulgences at a cheaper price. Founder Cyndi Ramirez-Fulton has a history of creating creative spaces, she’s the co-founder and partner of The Garret bars (her husband Adam is the other co-founder), and since opening the space in spring 2017, she’s managed to curate the perfect hangout spot to recharge and, of course, chill out. We sat down with the very chic Ramirez and chatted all things design, wellness cocktails, massages, and nails (Is there anything else you need in life?). Read on to see why this is only the beginning for this new concept space. Tell us about the incredible variety of drinks, from the hibiscus milkshakes to ube lattes. We wanted to create drinks that not only have plenty of health and mood benefits, but are also delicious and easy on the eyes. Right now, the menu is split into uppers and downers: On the upper side, you have your coffee beverages, of course, but then there are matcha and maca which are both stimulants and have incredible health benefits. On the downer side, we looked at ingredients like beetroot and ube to create yummy latte drinks that can be paired with kava or valerian root, which are plant extracts that put you in a relaxed state of mind and body. For us, the Chillhouse experience starts with that first drink. What inspired you and Jeffrey White of Ecology Architecture Urbanism for the design of the space? As far as design, we collectively decided that we wanted it to be a modern space that felt like an approachable oasis for busy New Yorkers. We wanted it to feel cozy, inviting, and most of all, clean. We took some inspiration from some of our favorite cities such as Venice, California, and Tulum, and our designer also brought in some Scandinavian influence into the mix. Chillhouse has an incredible array of non-toxic nail polishes, was that important? I love supporting newer, emerging brands. For us, being non-toxic was the only option. What’s the point in having two sections of your business that preach wellness and the nails being a toxic service? All the brands I carry I’m personally excited to have in our property. We want to introduce you to brands you may have never heard of before. Past the nail area is a serene, beachy massage section. What was the inspiration behind the aesthetic in this area? Glad we can help bring some of those vibes to our crazy city. For the massage experience, we want guests to feel like they’re entering a completely different ambiance when they’re back there. It’s immersive, relaxing, and an escape. For music, we have two completely different playlists. In the cafe and nail areas, the music’s a little louder and more uptempo. In the massage area, we play instrumental hip hop—”relaxing beats.” I curated the music, so for me, it’s about putting together playlists that instantly put you in a good mood. What inspired the combo of cafe, nails, and massages? Haha, right?! A few factors played into this combination, but it started with massage. My husband and I love massages, but we love them so much that we want to get them more frequently, which can be a total splurge. We realized the void in the market there instantaneously. In NYC, massages are either seedy and cheap or very luxurious and expensive. There was no middle ground. From there, it opened up conversations about the spa industry and what’s missing. It’s always been such a commitment to even go to a spa, both financially and from a time investment. But that’s just it: When it comes to self-care, it shouldn’t be a splurge, nor should it take two hours out of your day. We should be able to go somewhere and get that moment of relaxation without having to spend over $200. This hybrid allows for just that. Come in for a golden latte, or treat your hands to our Full Monty manicure, or if you need that extra chill, go get a bomb massage. Maybe throw in some aromatherapy for an even deeper chill. Massages start at $45 for 25 minutes and max out at $115 for 80 minutes. Extras like CBD or aromatherapy cost $8-$10. We just added a fabulous glass wall which separates the nails and cafe a bit. It’s a game-changer. We’ll be introducing more drinks, more food—created by our wonderful chef at our restaurant, Dinnertable—and we plan to start hosting community events. We’ll be hosting a couple of pop-ups and will be collaborating with like-minded brands. This is seriously just the beginning of Chillhouse. You ain’t seen nothing yet. This story was originally published in June 2017 and has since been updated with new information.